YouTube is the most visited video sharing website in world and recently completed its 6 years. Besides YouTube website, its videos can be viewed on Facebook, Google Plus, any blog or website. If you own a blog hosted on blogger you can directly utilize YouTube’s inbuilt sharing feature to post directly from YouTube to your Blog with few clicks. It reduces the time of getting the embed code for the video and then including it a post before publishing it. 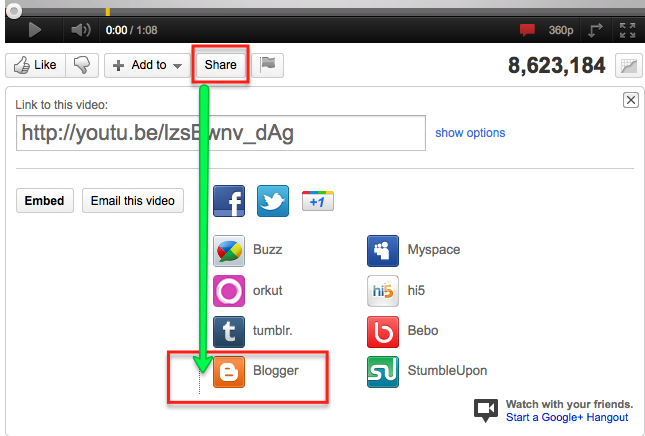 Below are simple steps using which you can easily post YouTube videos directly from YouTube to Blogger. Click on the share button just below the YouTube video. Select Blogger Icon as shown below. Once you click on Blogger icon, you would be required to log into your Blogger account if you are not already logged into it. After successful login a new post window will appear in HTML format and iframe code for YouTube will automatically be embedded into this. If you want you can write anything you like to publish with this video. By default title of post will be title of YouTube video which you might want to change. Using drop down menu on the top right corner you can choose the blog on which you would like to post this video. Now you can directly publish this post from here to your blog by hitting “Publish Post” button. You also have an option to save the post for later editing and publishing. This drafted version of post will be available in your Blogger account as well.